In this recent stretch of extreme heat no sound has pleased my ears more than the rattle of ice in my metal water bottle after I have crawled into my tent and pulled the bottle out of my pannier, hoping the ice in the drink I put in it an hour or more earlier hasn't melted. Even if I don't hear the sound, I know the drink will be considerably colder than the water in the three bottles attached to my frame, but to have a drink with ice in it when I have yet to cool down after a long day of being roasted is almost too good to be true. The chilled fluid soothes the throat and dissolves the misery of all those hours of being baked by the sun. It is always a challenge to just sip and make the drink last as long as possible. No alcoholic could enjoy a drink more than I do my ice-cold drink in my tent at day's end. At least when the sun sets, the temperature becomes more tolerable and at some time in the night I actually have to pull my sleeping bag over me. The morning hours are still somewhat cool until ten or so making me glad to be on the bike even though I know I am soon doomed to the inferno. It is no wonder that hell is hot and not cold. One of the worst things of these hot days is I must ride in those morning hours and can't stop at a diner for a stack of hotcakes. The bounty of calories is almost enough to get me through the day, but equally pleasurable is the dose of local color in small town cafes where most of the patrons know one another and though they may be seated tables apart speak loud enough that anyone can pick up on a conversation. To speak in modified tones would be unsociable and grounds for accusations of plotting or being secretive, inspiring someone to,blurt, "What are you whispering about over there?" After five days of blistering heat a slight decrease even of a couple of degrees was reason to celebrate. I still rode from ice-filled drink to ice-filled drink, but when a service station didn't have a table to sit inside in air conditioned comfort, it wasn't such a disaster to have to sit outside in the shade. I was ever in search of water to pour over me. I wasn't so happy during the blitz of heat when I arrived at the Carnegie in Canton after it had closed and neither of its water spigots were dispensing water. The library had none of the flourishes (columns or bay windows or high ceilings or elaborate light fixtures or dome) of the more prominent Carnegies. It blended in with the neighboring homes, but it was still a small gem. 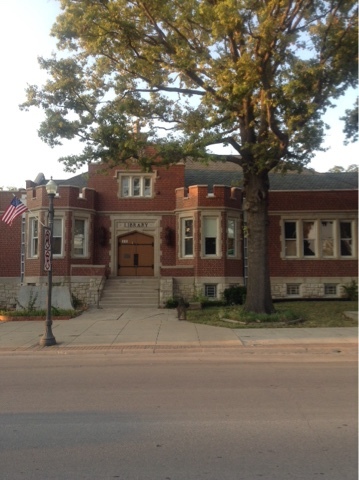 The town took extra pride in it, as it was the last of the 1,689 libraries in the US that Carnegie funded in 1921, and erected a sign out front to that effect. 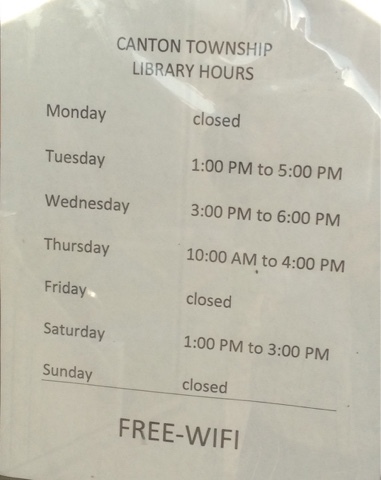 Canton was in such decline with most of the businesses empty and adorned with "for rent" signs that the library was only open four days a week for a total of fifteen hours. But at least it's WIFI hadn't been curtailed, nor did it require a password. I was lucky a small grocery store across the street was open until seven. It did not have a soft drink machine with an ice dispenser, but it did have a tankard that dispensed purified water for 59 cents per gallon. There was no charge for my small water bottle. If the winds hadn't been so fierce, or if I had known that my friend Laura, who I met through Facets over twenty years ago had grown up in nearby Peabody, I would have ducked back south on a diagonal road to its Carnegie. 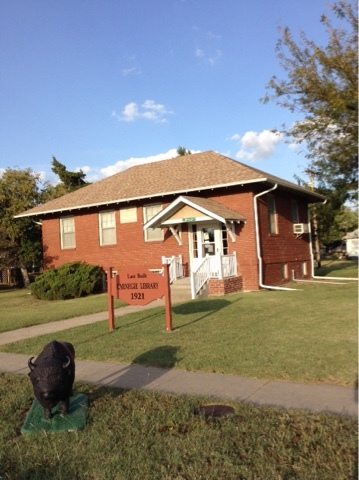 But I chose to stay north and head to the two Carnegies in Emporia, as I knew I could include Peabody on my next Carnegie foray to Kansas when I followed a corridor of them through Sterling and Hutchinson and McPherson. 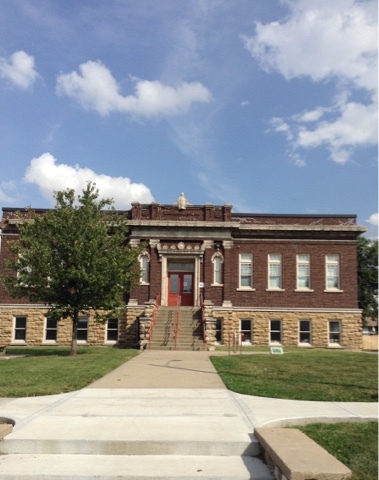 I had no luck finding the former Carnegie on the campus of Emporia College as the address given for it on Wikipedia had a church and none of the students I consulted on a Saturday evening when all the administrative offices were closed knew anything about it. I had to settle for just the former public library Carnegie, looking somewhat like a castle, now a museum right next to the new library. Like the Carnegie in Canton, the Carnegie in the similarly-sized Lyndon had a prominent sign out front letting the world know of its origins. It hardly needed the sign, as it had all the luster of a Carnegie. I almost thought I was in France when I noticed its opening hours were interrupted by an hour for lunch. France is frequently on my mind on my Carnegie quests. As I enter a town with a Carnegie, I brace myself for the sudden exhilaration of spotting it, knowing it will be the most historic and magnificent building in the town, just as I anticipate a town's cathedral in France, always a grandiose, monumental building, and like the Carnegies of America, in the town center. One might think the French with their love of reading would similarly honor their local library, but that is not the case at all. France does have one Carnegie, in Reims, built after WWI to replace its destroyed library, and it is a gem, just a couple blocks from its World Heritage Cathedral. But otherwise the country's libraries are nondescript or modern glassy buildings, frequently referred to as a "mediatech" in the modern lexicon. 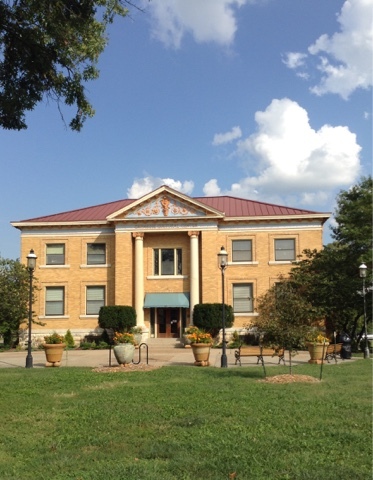 I found the Carnegie on the campus of Baker University in Baldwin City early Sunday evening, my third of the day after Lyndon and Ottawa. Ottawa's was now a Cultural Center sitting in a large park. 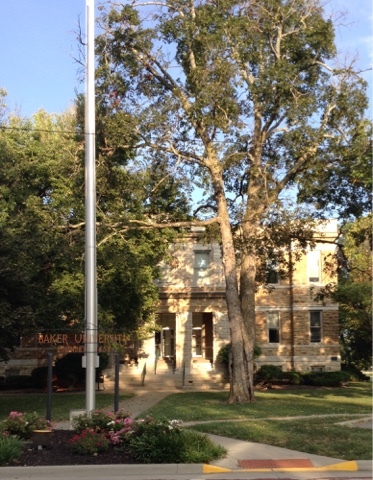 Baker's Carnegie was now an administrative building and had been replaced by a much larger library next door. I was able to tap into its wifi to call a reader of this blog who lived twenty-five miles away and had invited me to visit. I had been pushing it to try to make it this evening and had already biked seventy-four miles, my best day since the heat had hit. I had an hour-and-a-half of light left. If I got close enough to his house in Olathe, world headquarters of Garmin, within the sprawl of Kansas City, by dark, I was hoping there would be street lights or enough ambient urban light to keep riding. It would make for my first hundred mile day of these travels. I am always happy to have such a goal. Arriving at his house after dark would be a nice triumph. When dark hit I was still in semi-rural terrain. After being blinded by the brights of several approaching cars, I opted to camp behind an abandoned car mechanic's garage. Rather than feeling defeat I felt the exhilaration of a ninety-mile day in ninety-degree heat. 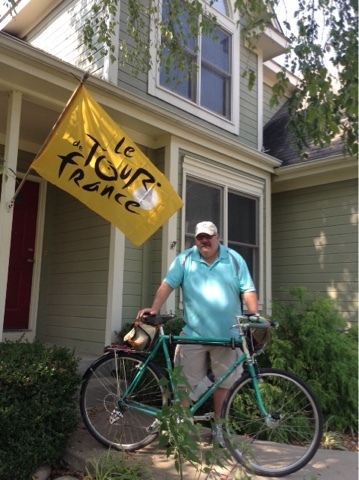 It was still a triumph to arrive at Bill's house the next morning, especially being greeted by a Tour de France flag that he had acquired when he paid The Tour a visit in 2008. We didn't know each other at the time, otherwise we would have rendezvoused at L'Alpe d'Huez, where we both were in the year Carlos Sastre attacked on the climb to win The Race. 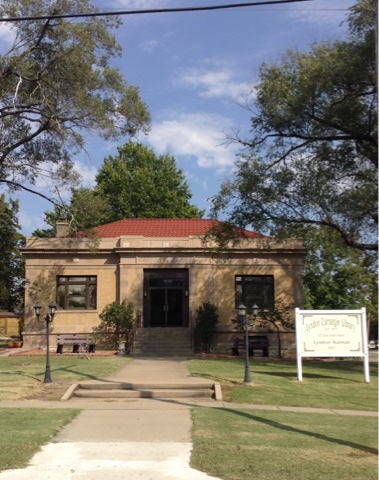 Bill had been laid off by Sprint and Erickson six months ago and was still enjoying his severance package, so was free to lead me into Kansas City and its lone, still-standing Carnegie, twenty miles away. It's not likely he can find work in his field, so he's been taking courses to become a paralegal. He had a garage full of bikes. He chose his prized Rivendale for our ride. We made it a leisurely four-hour ride alternating between bike paths and quiet residential streets and shortcuts that he knew. We passed through suburban developments similar to those featured in "American Honey," one of last year's best movies about dispossessed youth traveling the country selling magazine subscriptions. Bill hadn't seen the movie, but he had had such people come to his door. It was hot enough I was hoping we might pass a lake for a dip. If we did, Bill said, it would be a man-made lake, as Kansas did not have a single natural lake. Instead we had to settle for a drinking fountain in a park for a dousing. 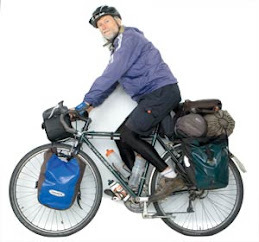 Though Bill hadn't taken to the bike until 2002 as a means to get a little exercise, he had become fully immersed in the pastime. Besides taking his son to France for The Tour, he had driven to California in 2010 for the Tour of California. His wife doesn't accompany him on his travels, as they house a couple of handicapped foster children and one of them always has to be on hand to take care of their needs. Though we had never met, we rode along like long-time pals thanks to our bonding over the years through the bike. Bill exuded a wholesome Midwestern warmth. I was in no great hurry other than to escape the sprawl of the Kansas Cities divided by the Missouri River before dark. Bill hadn't intended to accompany me all the way to the Carnegie, but he got me all the way there, even enlisting the help of a cyclist to guide us the last few miles to avoid the larger hills that laced the terrain the entire way. They had never met, but they had a mutual friend in the cycling community. Bill was enticed to accompany me all the way to the Carnegie, as his favorite military surplus shop was just a couple blocks from it. It was a huge warehouse with all manner of merchandise, some of it vintage items not for sale--a bike, a jeep, a motorcycle and various armaments. The Carnegie resided in a depressed neighborhood and was vacant, but retained all its splendor. Less than a mile from the library after a long steep descent Bill discovered a bulge in his front tire. We were lucky he hadn't suffered a blowout on our high-speed descent. He let some air out and continued on. Rather than trying to find a bike shop and bike home, mostly into the wind, he opted to call Uber. He didn't mind at all, as he drives for Uber, as well as Lyft, and thought it would be a worthwhile experience to be a passenger. He enjoys the work, as it suits his curious and gregarious nature. The Carnegie was to the west of the downtown, so he tagged along a little further with me towards the downtown where it would be easier for him to get a ride, before I headed north to cross the Missouri River to track down a Carnegie in the small university town of Parkville. George, it was indeed a real pleasure getting to meet you face to face and to ride alongside you. It was a long, slow ride. It's almost cold here today, as you're sure to be experiencing as you head further north now. I ended up not taking an Uber after all. When I realized how much it would've run to get me and the bike home from that far away, I phoned a good friend who works right on the edge of KCMO, just ten minutes from where I stopped (at a McDonald's I had in mind just about a mile from where we split up). He drives a pickup, and was able to come get me and the bike back home in no time, and it he's a great friend, so it was a day full of friends old and new, including our urban angel, Arthur, who led us around the biggest hills of the final three-mile stretch to the Carnegie. I hope you return to Kansas soon. Perhaps you could make it here in the evening next time and have a chance to spend a bit longer. As you can probably tell from seeing me, I know where all the best hotcakes and flapjacks are. If you're REALLY fortunate, Mrs. B will make Biscuits & Gravy.